I promised you guys that we'd video tape our "We're Going to Disney World!" announcement to share here on the blog. What I didn't expect was that our darn old video camera would refuse to cooperate, and we were left with a very blurry iPhone video. But it was too cute not to share. And I also got a new video camera out of it for Mother's Day...so it was a win-win, really. T and I agreed, after much discussion, that we'd wait until we were ready to go out the door for the trip before we told the girls. 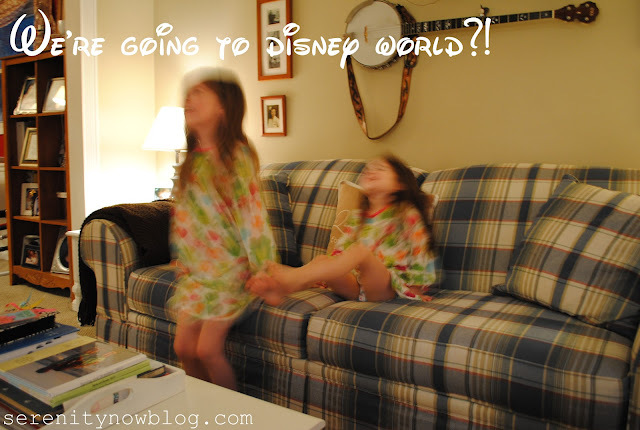 The suitcases were packed, and we woke the girls up at 5:45 am by rudely turning on their lights and saying, "Get up! Get up now! We have to tell you something!" You should also note that at 5:45 am, I sound like a 65 year old trucker with smoker's lung. I think Natalie was mostly excited about the prospect of missing several days of school and not having to go back to bed. I still think Michaela Byrd had no idea what we said, but just hopped off the couch because her sister did. I'm still in North Carolina today, hopefully making some headway in cleaning out the kitchen in my Nannie's house. Lots of canned goods from 1997 to clean out! I have a special guest poster tomorrow, and a great post with a blog tip for Thursday! Amanda, that's just thing ever! You really milked it, girl. And did I hear Natalie say "Holy Cow"?! What fun. That'll be an awesome memory for all of you! And now I see that I wrote "that's just thing ever" in that comment. Hopefully you got my message telepathically, but if not, I MEANT to say "that's the cutest thing ever." By the way, I'm awfully impressed that your girls look so adorable at 5:45 AM and that your family room is so nice and clean! That's so adorable! I really liked when she said, "Holy cow!" That is so stinking cute!!! What an amazing memory, for all of you! How cute! I loved seeing how excited they both were.